[156 Pages Report]The global PEEK market is projected to reach USD 664.3 million by 2021, at a CAGR of 6.3% from 2016 to 2021. The market is expected to witness growth in the coming years owing to the increasing demand from electrical & electronics and automotive industry around the world coupled with replacement of metals and other conventional materials by PEEK in a wide range of end user industries. In terms of value, the global market size of the electrical and electronics segment is estimated to be USD 170.3 million in 2016 and is projected to reach USD 235.1 million by 2021, at a fastest CAGR of 6.7% from 2016 to 2021. Demand from the aerospace and automotive industries is also projected to rise due to the increased usage of PEEK in fuel systems, induction systems, engine components, powertrain, brake systems, and transmission components in these industries. PEEK is used to manufacture various interior and exterior components in the automotive and aerospace industries. The most valued properties of PEEK are its high heat resistance, light weight, high dimensional stability, and high chemical resistance. In the aerospace industry, it is important to use materials that are fire retardant and emit less smoke & toxic gases in case of fire. PEEK fulfils these important requirements, resulting in its high demand in the aerospace industry. The past decade has witnessed a rapid increase in the implementation of stringent emission regulations, especially in the North American and European regions. To achieve greater fuel efficiency and meet these stringent emission regulations, the automotive industry is continuously in search of materials that can help in the weight reduction of vehicles. Though engineering plastics meet weight reduction requirements, increased compactness in under-the-hood components requires high heat resistance, which is provided by PEEK. As PEEK meets all these requirements, there is a rapid increase in its demand in the automotive industry. During this research study, major players operating in the PEEK market in various regions have been identified, and their offerings, regional presence, and distribution channels have been analyzed through in-depth discussions. Top-down and bottom-up approaches have been used to determine the overall market size. Sizes of the other individual markets have been estimated using the percentage splits obtained through secondary sources such as Hoovers, Bloomberg BusinessWeek, and Factiva, along with primary respondents. The entire procedure includes the study of the annual and financial reports of the top market players and extensive interviews with industry experts such as CEOs, VPs, directors, and marketing executives for key insights (both qualitative and quantitative) pertaining to the market. The figure below shows the breakdown of the primaries on the basis of the company type, designation, and region considered during the research study. The global PEEK market has a diversified ecosystem of upstream players, including raw material suppliers, along with downstream stakeholders, vendors, end users, and government organizations. Companies operating in the global PEEK market include Victrex plc (U.K.), Solvay S.A. (Belgium), Evonik Industries AG (Germany), and Panjin Zhongrun High Performance Polymers Co. Ltd., (China), among others. In October 2016, Celanese Corporation signed an acquisition agreement with SO.F.TER Group (Italy), one of the world’s largest thermoplastic compounder manufacturers. This acquisition helped the company in bringing technical expertise, production, and compounding capabilities for its products, and extended its footprint in Mexico, Brazil, Italy, and the US. In October 2015, Solvay S.A. acquired EPIC Polymer (Germany) and its long-fiber thermoplastics technology. This acquisition provided technologically advanced solutions for the specialty polymers division of the company. In January 2014, Evonik Industries AG launched VESTAMID Care, TROGAMID Care, and VESTAKEEP Care product lines to expand its high-performance polymers product portfolio. These products can be used for medical devices including catheters, surgical instruments, and hearing aids. 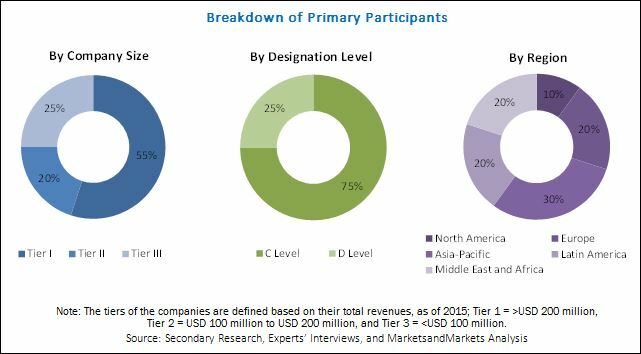 This research report categorizes the global PEEK market on the basis of end user, type, and region, forecasting volume and revenues as well as analyzing trends in each of the submarkets. What are new application areas for PEEK? 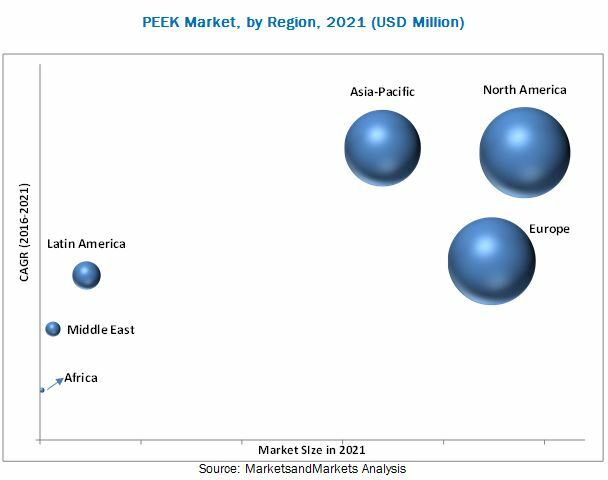 The global PEEK market is projected to reach USD 664.3 million by 2021, at a CAGR of 6.3% between 2016 and 2026. This growth of this market can be attributed to the growing demand from the end user industries in the developed economies, including the U.S. and the European countries, coupled with the increasing expenditure on electrical & electronics and transportation (aerospace and automotive) industries in emerging economies including China, South Korea, India, and Brazil. The electrical & electronics segment dominated the global PEEK market in 2015, followed by the aerospace segment. The electrical & electronics segment is projected to grow at the highest CAGR from 2016 to 2026 owing to the increasing demand from end applications. Glass filled was the largest type segment of the PEEK market in 2015. It is the most common type of PEEK and is used in a wide range of industrial applications. Between 2016 and 2026, the glass filled segment is projected to be the fastest-growing type segment owing to the ability to provide enhanced mechanical and thermal properties. PEEK has significant applications in the electrical & electronics segment as it possesses high heat resistance, excellent electrical properties, and greater dimensional stability, and is therefore a better alternative over traditional materials that are used. PEEK is used for the manufacture of wire insulation, filtration membranes, polymer parts for circuit breakers, batteries and capacitors, connectors, sockets and touch screen components. It is used in many electrical & electronics end-use industries such as telecommunications, semiconductors, display, and electronic components. The aerospace industry uses PEEK for manufacturing and production processes which include aero structure materials, aircraft machinery components, equipment systems and support, and cabin interiors. The high strength properties of PEEK are leading to a steadily growing demand from the aerospace industry. PEEK is light weight in nature and finds applications in the automotive industry for the manufacture of hoods, components and interior parts of vehicles to make them lighter, compact, and fuel efficient. Fuel systems, induction systems, coolant systems, engine components, powertrain, brake systems, sockets, and transmission components are some of the major automotive applications of PEEK. PEEK is used for extensive applications in the oil & gas end-use market. The high heat and chemical resistance properties of PEEK provide higher efficiency over the use of traditional materials. PEEK finds a wide range of applications in the oil & gas industry including sealing rings, tabular bars, rods, plates, and others. The high thermal stability and chemical resistance properties of PEEK are leading to its demand in the manufacture of pipe coatings, phenolic insulation foam for Liquefied Natural Gas (LNG) tanks, vessels, trucks, and for corrosion protection for storage tanks which are used in the oil & gas industry. The medical end user industry is a steadily growing market for PEEK and this trend is projected to continue during the forecast period. PEEK possesses good chemical resistance, greater thermal and electrical resistance, and minimal moisture absorption properties, and is therefore found to be highly efficient for medical applications. PEEK is used in several verticals like pharmaceutical, biotechnology, surgical equipment, diagnostics, and dental end-use industries. It is now widely preferred for the manufacture of medical equipment and devices such as sizing trials for knee and hip replacements and fixation devices. Asia-Pacific is the fastest-growing market as it is one of the major consumers of PEEK. There is an increasing demand for PEEK from both developed and emerging countries such as Japan, China, India, Australia, and others in this region. Increasing demand from electrical & electronics industry is expected to drive the growth of the PEEK market in China and South Korea. Growing population, urbanization, and investments in end-use industries are driving the growth of the PEEK market in the Asia-Pacific region. Increasing electrical & electronic components manufacturing, coupled with the growing automotive industry, is expected to further boost the PEEK market in this region. One of the major inhibitors for this market is the high cost PEEK. Manufacturing PEEK products that can withstand high temperatures requires a high level of technical competency. Also, PEEK manufacturers require considerably high investment, as the manufacturing process is highly complex than that for any other group of polymers. Due to these factors, the production of PEEK is costly, and thus the cost of end-products is also very high. The key players operational in the PEEK market include Victrex plc (U.K.), Solvay S.A. (Belgium), Evonik Industries AG (Germany), and Panjin Zhongrun High Performance Polymers Co. Ltd., (China), among others. 13.9 Prototype & Plastic Mold Co. Inc.